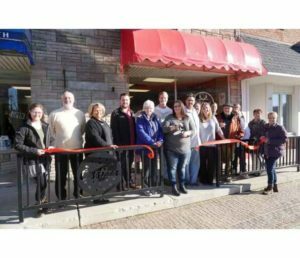 The Wells County Chamber of Commerce staff, Ambassadors, and Ossian Revitalization officially welcomed Tiffany Weiss, owner of Wildwood Bath Co., with a Ribbon Cutting on January 4, 2019. Wildwood Bath Company is located at 107 S Jefferson St. in Ossian. Tiffany Weiss started Wildwood Bath Company online two years ago and saw instant interest and success for her homemade creations in bath, body, and skincare products. Weiss started selling her products on Etsy after the demand started to grow from family and friends. Weiss makes everything in her store except for the soap, which is made in Indiana. Customers can find items made with natural ingredients such as cocoa and shea butter, rose clay, and oils made from avocado, coconut, and jojoba. “There are many health benefits and products that are great for the skin,” added Weiss. Everything in the store is custom-made by Weiss. “I research a lot of the market trends and product forecast and try and find out what ingredients are in certain products and figure out how to make it. I have always been creative and a DIY person,” Weiss explained. Weiss went to school for photography and learned graphic design. Weiss’s artistic talent has benefited her being able to create product labels, signage, and marketing for Wildwood Bath Company. Wildwood Bath Company supplies a variety of products such as bathbombs (in all shapes, sizes, and scents), body lotion, lip scrubs, moisturizing hair and skin oil, facial soaps, shower steamers, body butters, and even wonderfully scented wax melts. Wildwood Bath Co. is open Tuesday through Saturday from 10am to 6pm. Keep up to date on current products Weiss is making on the Wildwood Bath Company Facebook page.